Like oh-so many dystopian sci-fi parables, Headlander opens with the discovery of the lone survivor of a forgotten race. In this case, the last living human opens their eyes and says… nothing, actually, because they have no lungs to make a sound. As a disembodied head armed only with a rocket-propelled space helmet and the guidance of the mysterious benefactor who found and woke you, you must set forth into the great unknown to discover who you are, how you got here, and what happened to the human race. The lore is fine, as far as throwbacks to 1970s pulp sci-fi are concerned. The problems are in how the game plays. Headlander, for the most part, is a standard Metroid-style adventure: running though corridors, exploring room after room, acquiring the skills and weapons to unlock specific doors so you can keep exploring. The game’s big twist is your ability to pop the heads off robots, attach yourself, and use that body’s skills to your advantage. In theory, this should result in some fun body-swapping puzzles, like finding the right robots to open various successions of doors. More often than not, though, your choice of body doesn’t matter as much as your ability to survive getting shot at—a lot. With increasing frequency, the player, who has previous few combat capabilities, finds themselves swarmed by continuously respawning robot soldiers. The majority of enemies have some sort of laser cannon as a weapon. Some fire in multiple directions and all of them bounce off walls. This leads to many bullet-hell scenarios, with lasers ricocheting every which way and minimal maneuverability in your lumbering robot body. Even with the occasional post to take cover behind, combat largely consists of frantically running and gunning, desperately jumping to another body when yours explodes, and making a beeline for the nearest exit. Mobility opens up significantly when players abandon their robot bodies and explore hard-to-reach areas while in flying-head form. As you scour air vents and secret back rooms, the game feels more relaxed and playful than the tired shooting galleries and door puzzles of the areas that require a body. Piloting the head during combat can be extremely off-putting, though, as the multitudes of lasers, explosions, and dimly lit, ill-defined enemies make it far too easy to lose sight of your tiny noggin until after you’ve already been blasted. The limited side quests are where Double Fine’s signature humor has a few brief moments to stand out. Here, players have the opportunity to pop their head onto robot dogs and robot horsemen and do silly little robot dances, all to appease the requests of the nonviolent robots who maintain that this post-human landscape is more utopia than dystopia. These offbeat encounters are few and far between, though, and their presence makes the rest of the game’s lack of charm all the more apparent. The rampant fervor over next month’s No Man’s Sky suggests people are hungry for this breed of classic science fiction, for stories of wonder and discovery rather than super soldiers with laser blasters. 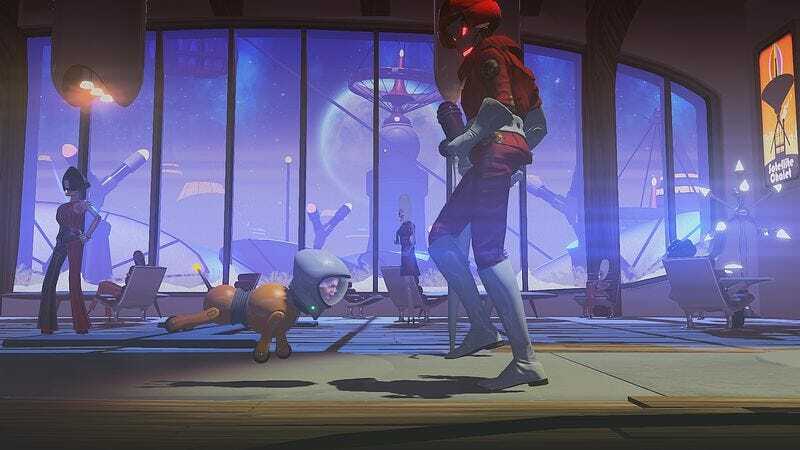 With its intriguing premise and VHS aesthetic, Headlander promises to deliver a retro sci-fi adventure in that same vein, but its moment-to-moment action can’t keep its end of the deal. Neither fantastical enough to satisfy the sci-fi aficionado nor silly enough to placate the comedy junkie, Headlander delivers only the scraps of what could have been a truly noteworthy space romp.